Help your pond remain beautiful and free of debris using this Little Giant Pond Skimmer. The convenient, practical design of this significant unit makes it simple to maintain, ensuring your pond looks lovely for several seasons. 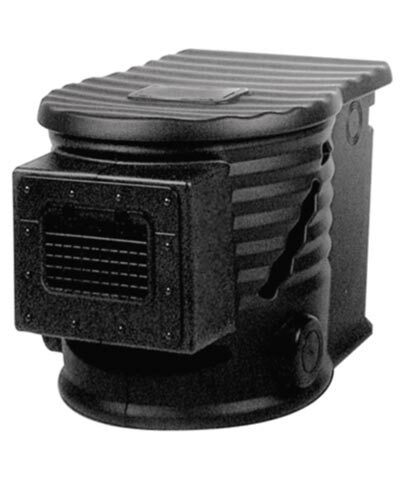 The item acts as a macrofilter, removing large debris from the top layer of your pond before reaching your pump. The easy-to-install weir cover plate features a twelve bolt attachment, a water level guide, and silicon sealant to ensure a leak-free fit to the liner. A removable grate in front of the 8.75" wide weir stops fish from entering the unit, and a large capacity leaf net inside the piece catches debris with ease. Six brushes hang from a rod behind the net, polishing the water and acting as a further barrier for debris before it reaches the pump. Both the brushes and leaf net are easily removed for routine maintenance and cleaning, and the pump compartment offers ample space for most pumps. Depressed rings near the top of the unit assist you in drilling a 2.5", 3", or 3.5" diameter hole to accommodate your pump tubing, and these rings on either side of the filter offer versatility in plumbing the unit. Additional, 3" diameter depressed rings on the base of the unit allow you to add a bottom drain if desired. The ridged, plastic lid fully covers the skimmer, and a cap on it allows you fill this section with sand for added weight. A notch on the lid accommodates your pump's cord while keeping the lid flush, and included silicone helps create water tight seals throughout the unit. Easily maintain a debris free pond with this Pond Skimmer. One year limited warranty.